You came, you ran, you conquered. Maybe finished is more like it. Either way, you earned that title of marathoner and the right to wear that medal around your neck to dinner, to bed, to breakfast Monday morning. But now that you don't have to worry about logging all those miles, it's time to celebrate. You know, do all of those things you may have sacrificed over the last few months. Drink a beer--or a lot of it. Eat ice cream--OK, so that's my favorite post-race treat. Sit down, relax and veg out--again, that might be me. Here are my top five ways to refuel and refresh after Sunday's Bank of America Chicago Marathon. Nothing special, but I can guarantee that knowing I'll have some treats after the race will help carry me through it come Sunday. Sometimes it's the little things that get me through the tough miles. Drink chocolate milk. Team Refuel's busy prepping for the Ironman World Championship, but that doesn't mean our muscles can't use a little chocolate milk to replenish after running 26.2 miles. I guzzled two cartons after my Ironman, a welcome change from the sports drink, which I'd like to think made my muscles happy campers come Monday morning. Pizza, pizza, pizza. Before the race, we pasta'd up. After the race, we can pizza up. Ooh, all that gooey cheese and thick crust of a Chicago-style deep dish, my mouth is already starting to water. Plus it's national pizza month and several Chicago restaurants have deals and special pies. 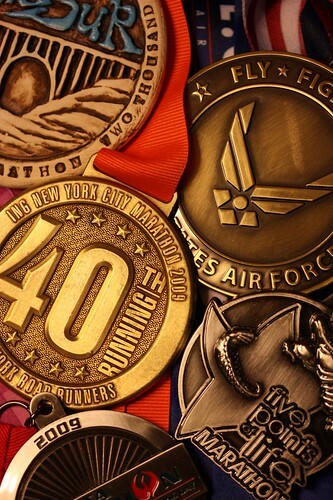 Engrave your medal. Whether you want to remember your finish time or you have a special saying to commemorate this race, you can engrave your marathon medal at Nike Chicago or Fleet Feet Sports Chicago after the race. Fleet Feet's post-marathon party starts Sunday and goes through Columbus Day, and Nike Chicago turns into finisher's central when the doors open Monday (and they've recovered from Sunday). Get a massage. Equinox is offering 15 percent off massage services at its 900 N. Michigan location, and FFC is offering a 10 percent massage discount at its facilities. Bring in your race bib to receive the deals. Time to reward those muscles and get the inflammation out of your system. Celebrate. You just ran a marathon. Whether it's your 13th, your 30th or your first, it's an accomplishment that not everyone can say they've done. Maybe your celebration means kicking up your feet? Or maybe it means planning another race? We all have our reasons. How do you refuel, refresh and recover after your big race? Photo grabbed from tedmurphy at flickr. Nice, Pete! Are you recovered from Sunday? Did you end up getting your medal engraved so you could cross another # off the list?